WWT’s Monitoring team has undertaken a range of other waterbird monitoring projects, and some of these are highlighted here. The first Mute Swan census in Britain was carried out in 1955/56. Further surveys were then conducted in 1978, 1983, 1990 and 2002. The aim of the census was to estimate the population size, distribution and habitat used during the breeding season. The 2002 census adopted a random stratified sampling method. Observers visited a set of randomly selected 10 km squares, surveying all habitats within each square usually during a single visit between 1 April and 31 May 2002. 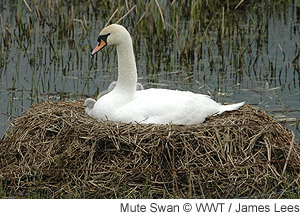 On locating pairs of swans, signs of breeding were recorded by the presence of nests or cygnets. For non-breeding birds, the size of the flock was recorded. The 2002 census was organised by WWT in partnership with the British Trust for Ornithology, the Scottish Ornithologists’ Club and the Swan Study Group. Ogilvie, M.A. 1986. The Mute Swan Cygnus olor in Britain 1983. Bird Study 33: 121-137. Ogilvie, M.A. 1981. The Mute Swan in Britain, 1978. Bird Study 28: 87-106. Campbell, B. 1960. The Mute Swan census in England and Wales, 1955-56. Bird Study 7: 208-223. 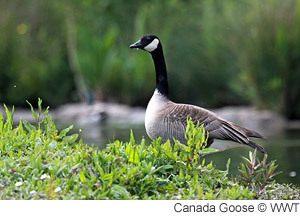 The first complete Natuarlised Goose Survey was conducted in 1991, with a second survey in 2000. The aim of the survey was to assess population size, distribution and productivity of all non-native geese in the UK. The survey followed a site-based approach to monitor moult sites during June and July. Counters surveyed sites regularly monitored as part of the Wetland Bird Survey (WeBS), as well as additional sites not usually surveyed for WeBS but which were known to hold naturalised or re-established geese. During the 2000 survey, counts were also conducted at a suite of randomly selected tetrads. In January 2003, the Wetlands International/IUCN SSC Cormorant Research Group organised a European-wide survey of Cormorants to assess winter numbers and distribution. 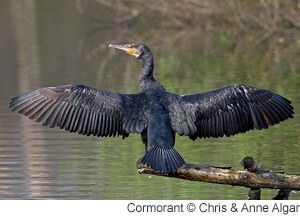 The census involved counting Cormorants at night roosts at both inland and coastal sites throughout Europe and North Africa. WWT coordinated the census in Britain. Counts across the Western Palearctic are now organised by the Cormorant Research Group. For more information about these counts click here.